Taiwanese Artist "Cai Jie-Shen (蔡潔莘)" invented the character Hug: Let us hug each other today!. “Art” is not just an installation inside a room that you can see from afar and not touch. Cai Jie-Shen, one of the new-generation artists wants to promote the life of “art”, meaning to increase the amount of participation of visitors in his masterpieces. In the busy city, what kind of things can make us stop and breathe? And relax the highly stressed souls in all of us? What kind of places can allow you and me to relax our eyes and feelings? Perhaps it is here, in the arms of art! I was asked to make Hug bento box for the Very Fun Park’s 10th Anniversary. Since it is a meaningful exhibition, I decide to participate as an artist with my creative bento. 1. Flavor the rice with a pinch of salt. 2. Place lettuce in the Bento box. 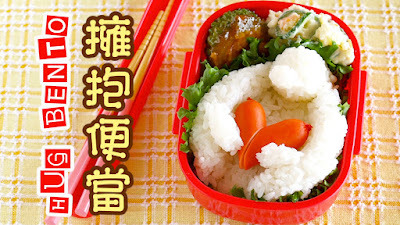 Form the rice into Hug shape using plastic wrap and put into the Bento box. 3. Cut sausage diagonally and join the cut sides reversely to make a heart shape. Let Hug hug the heart. 4. Put side dishes in the Bento box to finish.